Gavin Rossdale is an English musician, known as the lead singer and rhythm guitarist of the rock band Bush as well as an actor. Following Bush's separation in 2002, which lasted for eight years, he was the lead singer and guitarist for Institute, and later began a solo career. He continues to perform both Bush and Institute songs during his solo concerts. Rossdale is married to fellow musician Gwen Stefani. Rossdale was born in Kilburn, London, the son of Barbara Stephan (Bowie) and Douglas Rossdale, a doctor. His mother was born in Scotland and his father's parents were of Russian Jewish descent, the family's surname originally being Rosenthal. His parents divorced when he was eleven years old, and he was raised primarily by his father and aunt. His mother remarried and moved to Tampa, Florida. Rossdale has a younger sister, Soraya, and an elder one, Lorraine. Rossdale's half brother, David Rossdale, is the Bishop of Grimsby (a suffragan in the Diocese of Lincoln). Rossdale's half sister, Georgina Rossdale-Smith, is a doctor. Rossdale learned to play bass guitar after hanging out with his sister Lorraine's boyfriend, who was in a band called The Nobodyz, but he switched to rhythm guitar. At 17, he left the Westminster School, and formed a band called Midnight (formerly Little Dukes), which produced a couple of singles and many publicity photos. In 1991, Rossdale moved to Los Angeles for 6 months, lived where he could, and took whatever part-time jobs were available, including production assistant on video shoots. He spent some time in NYC before returning to England where he hooked up with future manager Dave Dorrell (MARRS), whom he had met in LA. In 1992, Rossdale formed Future Primitive, whose original line-up included screenwriter Sacha Gervasi, who left to pursue a film-making career. The band changed its name to Bush in the summer of 1994 and released the promo Sixteen Stone. 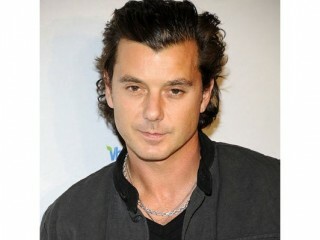 2008 : "Love Remains the Same"
2009 : "Forever May You Run"
2010 : "End of Me"
View the full website biography of Gavin Rossdale.